Brand new in original packaging. Packaging is lightly distressed/damaged from shelving. Beautifully crafted in stoneware, Lenox's White French Perle Dinnerware boasts intricate details that recall hand-embroidered fabrics. These charming, jewel-like elements bring sophistication to everyday dining as well as more formal occasions. 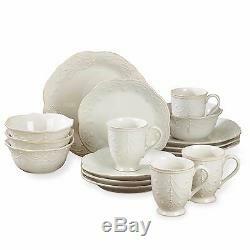 Lenox's lovely White French Perle 16-Piece Dinnerware Set is perfect for casual dining as well as formal occasions. Beautifully crafted with jewel-like elements inspired by hand-embroidered fabrics. Mix and match French Perle pieces to create your own colorful tablescape. All Item's are 100% Brand New & NEVER Used! Until all items are won. Please message us when you are ready to pay. The auctions should end within 10 days of each other and must be checked out at the same time, with one. The return merchandise must be in it's original condition. We are dedicated to our customers and feel you should have the personal attention you deserve. Not only do we offer incredible pricing, but it is our desire to provide 5 star customer service to you every day. We continue to make YOU, our customer, our number one priority. We want your continued business! We would love to hear from you if you have questions, suggestions or just want to chat! PLEASE NOTE THAT ALL COUNTRIES CHARGE A DUTY ON IMPORTED GOODS. WE ARE NOT RESPONSIBLE FOR THE AMOUNT OF THE DUTY CHARGED. The item "Lenox French Perle White 16-piece Dinnerware Set Service for 4 NEW" is in sale since Thursday, September 28, 2017. This item is in the category "Home & Garden\Kitchen, Dining & Bar\Dinnerware & Serving Dishes\Dinner Service Sets". The seller is "stealseveryminute" and is located in Selden, New York. This item can be shipped to United States, Canada, United Kingdom, Denmark, Romania, Slovakia, Bulgaria, Czech republic, Finland, Hungary, Latvia, Lithuania, Malta, Estonia, Australia, Greece, Portugal, Cyprus, Slovenia, Japan, China, Sweden, South Korea, Indonesia, Taiwan, Thailand, Belgium, France, Hong Kong, Ireland, Netherlands, Poland, Spain, Italy, Germany, Austria, Bahamas, Israel, Mexico, New Zealand, Philippines, Singapore, Switzerland, Norway, Saudi arabia, Ukraine, United arab emirates, Qatar, Kuwait, Bahrain, Croatia, Malaysia, Brazil, Chile, Colombia, Costa rica, Panama, Trinidad and tobago, Guatemala, Honduras, Jamaica, Antigua and barbuda, Aruba, Belize, Dominica, Grenada, Saint kitts and nevis, Saint lucia, Montserrat, Turks and caicos islands, Barbados, Bangladesh, Bermuda, Brunei darussalam, Bolivia, Ecuador, Egypt, French guiana, Guernsey, Gibraltar, Guadeloupe, Iceland, Jersey, Jordan, Cambodia, Cayman islands, Liechtenstein, Sri lanka, Luxembourg, Monaco, Macao, Martinique, Maldives, Nicaragua, Oman, Pakistan, Paraguay, Reunion, Viet nam, Uruguay.